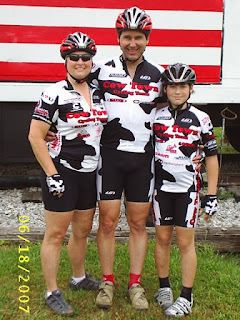 This time we visited so I could race in the 3rd Annual Tribute Triathlon. I tried to get Carolynn to do the event with me as her First Triathlon. The swim is fairly short and is held in a small lake. The bike is 18 miles long which would suite her cycling background. The run is 5K. She opted to just ride the Katy as I raced. For me this event was a "B" level event so I put a little pressure on myself to do well. I like this event because it has a longer bike leg in relation to the swim/run legs and all the profits from the event go to a charity. The community really supports this event and the volunteers are great. Awaiting the start in my new Hammer Nutrition kit. I am very happy that I picked up Hammer Nutrition for a triathlon sponsor. I have used their products successfully for the past several years and they have always supported the events I have promoted. A great company with proven products that I am proud to support. Everyone getting ready for the start. First event up is the swim. The announced the distance was only 350 yards. . However, the swim was the same as previous years when it was 500 yards. Some nervous folk getting ready. A newer trend is starting with some triathlons. Single file starts instead of starting in waves. I kind of like it. 10 seconds between participants. It is safer and to an extent may be more fair to everyone considering that another swimmer does not interfere with your swim. I liked the green carpet. My feet are tender and I dislike running barefoot on pavement. My swim was o.k. Shoulder giving me some concerns so I have not swam much as of late. Plenty of PT instead. Carolynn hit the Katy trail for a ride after I got out of the swim so no pictures of the bike nor run. I had a very solid bike. My setup is very comfortable to me which is most important in my opinion. The course was an out/back with rolling hills. It was a bit windy, which kept the temps down, but made the bike hard at times. One of my goals was to bring my effort up to my current threshold and keep it there. I did not want to push so hard on the bike that I fell apart on the run. I have learned the hard way to hold back some on the bike so I can have a more successful run and a faster overall time. I continue to be impressed with the Kenda Volare tubular tire. This tire just rolls fast and continues to perform even on the rough country roads we had today. I am sold on tubular and tubeless on the road for sure. My run was o.k. I really need to get my run times down. I would be happy with just running a 6:45 average after my bike leg. I plan to add a weekly brick workout to my schedule. I normally do one the week of the triathlon, but that is just not cutting it. Adding more running miles would help also. I only get out once or twice a week if I am lucky and it shows. Results were really quick thanks to Ridge Runner Sports. They have been timing for 20 years and they have their act together. I was a little surprised by my race times this year. Two years ago, when I believe I was in better shape, I had a finishing time of 1:27. This year I came in at 1:21. Even with a (reportedly) shorter swim this year having a 6 minute improvement is rather substantial. Two big improvements was a faster bike (22.1 mph average this year) and a much improved T1 time. The bike time is a little deceptive because you time begins when you exit transitions and includes your run out to the start of the bike. The last improvement came on the run which really surprised me. This year I did not have any cramping issues and my energy level remained high throughout the event. I contribute this to a well thought out pacing plan and proper nutrition prior to the event, especially on race morning. Check out Hammers Top 10 Biggest Mistakes Endurance Athletes make. The 10th mistake is over eating the night before and eating at the wrong time. I used to always overeat before and during events. No more. The results of hard work. I got overall win in the Masters Male division. Here I am with Overall winner Brad Cope. Brad actually lives just a few miles from my house in Riverside, MO. It is a small, small world after all. I really like the award I received. It is custom made from a slate of stone and comes with a stand. I will put this up on the trophy case for sure. This is what I was talking about last week. Awards are indeed special and should be nice and worth keeping on display. I will be back next year to see if I can add another one to the collection. The Warsaw promoters did a lot of good things like having a cool finish line, a well marked course, food vendors, podiums and plenty of volunteers. Down and Dirty had a mass start for all the divisions. Christopher was a little concerned about this as it is really easy for other classes to have an "effect" on a State Championship race, plus you do not know who you are racing against. Separating the start into several waves, especially with the narrow starting area, would have been a good idea. However, everyone had the same conditions. I told Christopher just to ride within himself and not to worry about who is in his class. I also told him that he would most likely catch the tail end of the Marathon class and to try and not let them hold him up. He has a habit of not passing when he should be more aggressive/assertive and make the pass. Everything worked out well as he was able to pass Dylan Bartlett for the lead about 3 miles in. He did not let anyone hold him up very long which was a good thing because he only had a 30 second cushion when he came up to finish. As I mentioned above, I was just out for a training race. It was nice to visit with my teammates. 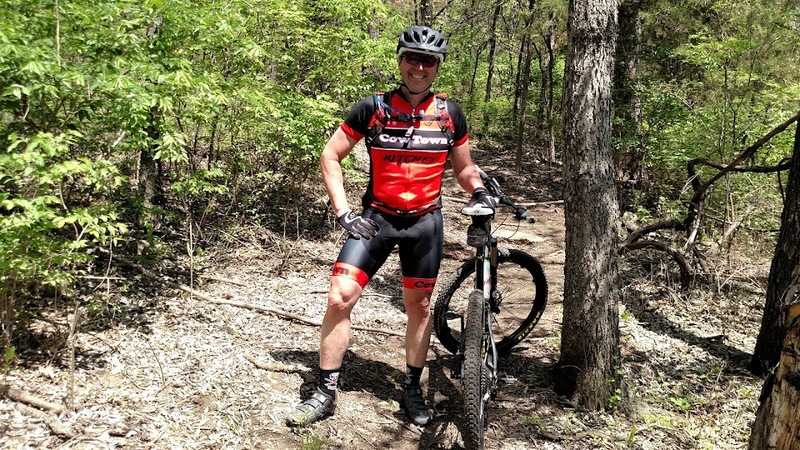 The Truman Lake Mountain Bike Park course was fast and fun. I was a little disappointed with the lack of technical features. I was told that Warsaw had some technical sections, but I did not find any. The flyer said it was "challenging" with rocks. None the less, I had a smile on my face for most of the day. That was until I got really, really hot on that 3rd lap. Not riding with a Camelbak in that heat took its effect. As you can see by the above picture, tire selection/set-up was important. All I can say is Kenda tires ROCK! Christopher was really hoping to bring home that sweet Gold/Red/White/Blue Missouri State Championship jersey, but all he got was a printed award on paper along of course with the Gold medal (provided by USA Cycling) he worked so hard for. As you can see by Dylan's, Dalton's and his face they were not real happy campers. Hopefully the promoter can get MOBRA to come up with jerseys for all the class winners. I also talked to Andy who said that this is in the works. That is good to know. In the mean time, I gave Christopher my jersey that I won several years ago to have. He was much happier after he put it on. You may notice I am critical of the awards. There are several factors that go into this. One is that I feel that if you are going to promote the state championships event that you should do it right. As a promoter I always felt it was an honor to host a state championship event. Awards are very important to me, both as a participant and a promoter. I put a lot of money into awards over the years because I feel participants should be awarded something unique for their efforts. To see generic paper awards (not even class distinction) be given to class winners just is not right. Christopher has not raced in several years, but he has been involved in our events and he personally has put a lot of work into awards. So I guess he expects the same as I and was a little upset. Add in that he did not get to celebrate on the podium with a state championship jersey which might have been his last chance. He is thinking of trying out for Cross Country next year as a Junior and will put cycling on the back burner. This past weekend we hit the restart button. I had just about given up on competitive events after my latest results. I just did not have the passion and drive to suffer to achieve the results that I excepted of myself. Christopher quit racing several years ago mainly due burnout and a lack of passion for what he was doing also. He really did not enjoy riding and was only doing it because his parents rode. Some parents would try and push their kids to participate in sports, but I did not. I did not want force him into anything. I told him that if he ever wanted to race or participate in any sport/endeavor that we would be there for him for support. My only requirement was he do it because he wanted to. Christopher's return to XC racing in the Robidoux Roundup was a successful one. He took 1st place in the Junior 15 - 18 class despite another nasty crash. If he does continue racing I have a feeling it is going to cost Carolynn and I a small fortune. The kid has crashed the past 6 rides but just gets back up smiling. That is a good thing. A couple of weeks ago I participated in the 2012 ITU World Cross Triathlon Championships. I say participate because I damn sure did not race it. At least I do not feel like I did. Sure I had dreams of standing on the podium at Worlds, but that did not happen. What did happen is I got 14th with an effort that I would just as soon forget. Looking back I just did not give it a true effort. Why would I go to a race and not give it 100% you ask? Most likely a lack of focus. A lot of things have happened to me the past couple of months, especially the past two weeks. When I look back I most likely should have withdrawn from the event. I knew going in my mind and heart was just not in it. Carolynn said we should go anyways and just enjoy a few days by ourselves and enjoy riding some new trail. We did achieve that goal so I guess it was a success. Bad performances are o.k., you learn from them.What I have learned yet again is that if you are going to do something do it with passion.